There are some movies that, no matter how stylish and ostensibly well-made they may be, are almost instantly forgettable the moment you leave the cinema. 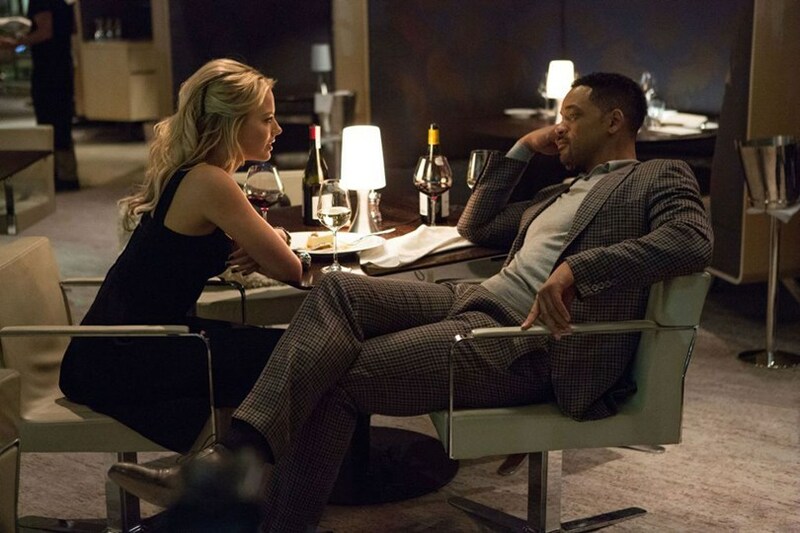 They are enjoyable enough at the time but fail to resonate beyond the moment of consumption and the Will Smith-starring Focus is just such a film. It’s pretty enough to look at and the cast all go about their business is a mostly competent way, but Focus suffers from the fact that it doesn’t match the standard of those films that have gone before it. 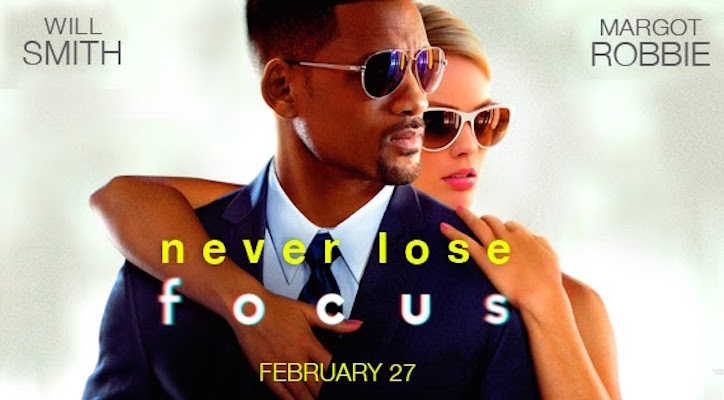 You see, Focus is a caper film in which the various twists and turns of the narrative are seemingly designed to make the whole thing seem a bit cleverer than it really is. There is nothing overly original here and Will Smith is certainly no George Clooney type in that he lacks the necessary charm to make us overlook his criminal behaviours and like him anyway. Oozing all the generic features of a caper movie – attractive people lying and double-crossing each other, a super-slick seasoned grifter taking on a precocious upstart, luxurious locales and increasingly elaborate scams – there isn‘t much in Focus that hasn’t been done before with regard to the basic premise. Of course the players, the locations and the swindles may change, but ultimately this plays out like an extended episode of British television show Hustle, albeit taking itself a little bit more (too) seriously. Yes, there are some lighter moments and the on-screen chemistry between Smith and Aussie starlet-of-the-moment Margot Robbie seems authentic despite their characters engaging in a relationship that is anything but. Smith’s Nicky Spurgeon is a master conman who runs a large group of pickpockets, scammers and tricksters who engage in all manner of deceptions, raking in millions of dollars from their unsuspecting marks. Jess Barrett (Robbie) is a glamorous new-kid-on-the-block with big ambitions whose ‘talents’ draw the notice of Nicky and soon the pair are partners in both crime and coitus. Whilst there has been some praise for the inter-racial romance, which is definitely a rarity in mainstream films, Focus certainly fits the Hollywood model in other areas, such as the fact that Jess relies on her appearance – swimsuits, figure-hugging dresses – to seduce her victims and is only invited to join Nicky’s crew after she has slept with him. Needless to say, once her services are no longer required, she is promptly discarded, only to re-appear in his orbit a few years later as their respective scams become intertwined. To her credit, Robbie makes a reasonably good fist of her role and her repartee with Smith is amusing at times. The opening part of the film in which the crew swipe all manner of items from myriad victims amidst the hustle and bustle of busy New Orleans is the most exciting part of the film before it becomes bogged down in a much more elaborate, and utterly unlikely, scenario involving a bunch of Formula 1 team owners who must collectively be the most gullible group of characters seen on screen for quite some time. With sleight-of-hand artist and self-proclaimed ‘gentleman thief’ Apollo Robbins serving as a consultant, directors Glenn Ficarra and John Requa make every effort to keep the audience guessing and, as such, the ending may well come as a surprise for some, but the fact that we learn so little about the characters other than their penchant for pilfering makes it hard to care too much about what happens to anybody. The good-looking stars and good-looking locations, which include New York and Buenos Aires, help you overlook what is a fairly typical story. There are plenty of elaborate tricks played out – including an extended sequence at a football game featuring Law and Order’s BD Wong sporting a comical (but perhaps unintentionally so) moustache and mannerisms – but ultimately Focus flounders due to a lack of originality and a distinct absence of any significant character development.